Watching Henry Paulson explain the trillions of dollars spent on the banks today, it didn’t make me yearn for the good old days when capitalism was even more unfettered than presently. He, and his friends Tim Geitner and Larry Summers, epitomize what happens when bankers and their lackeys run America. Conservative politicians and commentators (have a “Rush”) agree that all our problems today are caused by government regulation of business and taxes levied. Those regulations restrict capitalist freedom, the right of companies to do what they want in the marketplace. Which brings me to the free market utopia of the past – particularly Great Britain in the early 1800s. For hundreds of years the working class in that richest nation in the world lived better than some residents of Africa and Asia. That prosperity included rented houses and bread and butter. There was a down side. Like today’s Americans, both husband and wife had to work. Fortunately for capitalism the work day was 12 hours, not eight, and six days a week, not five. That’s 72 hours. But you got Sunday off to thank God for your blessings. There was another difference between then and now. You didn’t need a babysitter for children over eight, which saved money, as any working mother will explain today. However, the children weren’t actually in childcare. 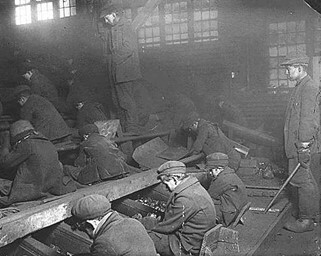 They had jobs, to teach them responsibility and earn extra money for family luxuries, like coal to heat the house. Speaking of coal, the mines were big employers of children. Here is a quote from http://www.dmm.org.uk/. Drawers pulled heavy carts of cut coal to the pits surface with heavy chains around their waists. ” I am a drawer, and work from six o’clock in the morning to six at night. stop about an hour at noon to eat my dinner: I have bread and butter for dinner; I get no drink. A trapper, only 10 years old killed in an explosion. A horse driver aged 11. Crushed by horse. A driver, aged 14 fell off limmers and was crushed between the tubs and a door. A token keeper aged 14. Crushed by surface wagons on branches. A screenboy aged 12. Crushed by surface wagons. A trapper aged 12. Crushed by tubs. A driver aged 12. Horse fell on him. A bank boy aged 11. Caught by cage. A driver aged 12. Head crushed between tub top and a plank while riding on limmers. A trapper aged 13. Head crushed between cage and bunton while riding to bank. Tub Cleaner, aged 13. Fell down the shaft off a pumping engine. Boy, aged 7. Killed in an explosion. Trapper , aged 9. Killed in an explosion. Driver, aged 14. Crushed against wall by a horse. Screen Boy, aged 15. Head crushed between a tub and screen legs; too little room. Unfortunately for free market purity, in 1847 the government passed a law forbidding the working of women and girls in mines, and all boys under the age of ten. When we hear about deregulation, like the kind advocated by the Democratic Leadership Council, the New Democrat Coalition and the Republican Party, remember the children of years ago, and realize history teaches us that our grandchildren will face an onerous life if business is allowed to do whatever it wishes.